Tip-Ex 2012. ND Brown vehicles on display. 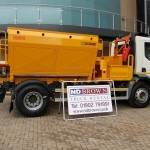 ND Brown will have 2 vehicles on display at the forthcoming Tip-Ex 2012 Show in Harrogate taking place from the 25th to 27th May 2012. Both these vehicles are available For Hire for short, medium or long term. Please call for details – 01902 791991. 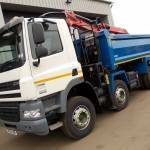 1st Vehicle – DAF CF85 32 Tonne Tipper Grab featuring Epsilon Crane, Edbro TS26 under floor tipping gear and Thompson all steel tipper body. 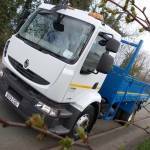 2nd Vehicle – Renault Midlum 270 DXI 18 Tonne Insulated Tipper featuring Edbro CX11 front end gear, Stag Insulated Tipper body with spring assist drop sides, 3 tar chute tailboard and ‘ND Brown Safe Access Zone’.